Dr. Marla Mendelson, director of the Center for Women’s Cardiovascular Health of the Bluhm Cardiovascular Institute, discusses tips for women’s heart health Saturday. The program, created by Weinberg sophomore Annie Krall, was held in Norris University Center. After learning about the disparity in heart health care between men and women, Weinberg sophomore Annie Krall launched a program Saturday aimed at encouraging ways to improve heart health among college-aged women. The program, organized by Panhellenic Association, kicked off with a workshop including a presentation focused on myth-busting and advice to improve heart health. After Krall and Dr. Marla Mendelson, an expert on women’s cardiovascular health at Feinberg School of Medicine presented, two fitness instructors led audience members through a quick workout. About 80 people attended the workshop. Both Krall and Mendelson, director of the Center for Women’s Cardiovascular Health of the Bluhm Cardiovascular Institute, told The Daily that they hope the workshop will act as a pilot that will spread to other college campuses. Krall said they plan on reaching out to colleges and universities in Illinois with the hope that the American Heart Association will help spread their workshop nationwide. Because twice as many women die from heart disease and stroke than from all cancers combined in the United States, there is a “great need” for spreading health advice and medical information related to the topic, Krall said. Krall, who hopes to attend medical school after graduating, told The Daily she was spurred to action after reading an article in Northwestern Medicine magazine about the story of a 33-year-old woman who suffered cardiac arrest despite a lack of family history related to heart problems. 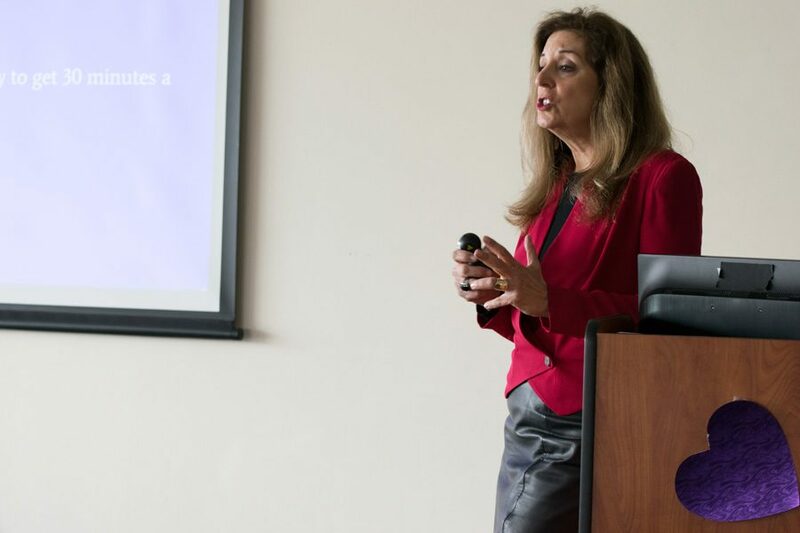 Women at Northwestern tend to be “doing a million things at once,” Krall said, and she was motivated to take a step back and educate her peers about the negative health effects associated with stress. She said stress, which often comes as a result of overinvolvement and academic rigor, can prevent women from exercising and partaking in self-care. “If you can instill in (young women) this drive to be better, eat better, not drink as much … that gives them so many more benefits later in life,” she said. During the workshop, Mendelson said although family history and other risk factors are unavoidable, there are steps that women can take to prevent heart disease and stroke. She said one glass of wine per day and a diet rich in omega-3 fatty acids can greatly reduce the risk of heart attack and stroke. Mendelson also emphasized the disparity in cardiovascular treatment between men and women. Women can be reluctant to seek help, even when experiencing heart pain, she said. When they do seek help, hospital treatments often fail to adequately address their needs, she said. “Women literally came into the emergency room with chest pain, were given Tums and sent out the door, while men got all sorts of tests,” Mendelson said. Andrea Berk, a retired Northbrook resident who attended the event, said she came to learn about advances in health care for women because conversations about heart problems are largely centered on older men. Though Berk said she already knew much of what was discussed at the event due to her heart problems caused by chemotherapy, the fitness lessons and liveliness of the presenters motivated her to become more active. “I’m interested in women and heart disease because we’ve had the short end of the stick for a long time,” she said. This story was updated to clarify that Panhellenic Association organized the event.